The Purge: Anarchy is a much better film than its predecessor, but still not good enough to overcome a fatally flawed premise. Last year’s The Purge used the high concept of 12 lawless hours as a flaccid setup for a sub-standard home invasion thriller. At least there was an excuse for not calling the cops beyond lack of a cell phone signal. This time around we’re put on the front lines to see the chaos through various sets of vicious purgers and their potential targets. While initially more interesting, the ramped-up mayhem also brings new sets of narrative issues. It’s a year after the events of the first film and nothing has changed as America prepares for the next Annual Purge, where by decree of “The New Founding Fathers” all crime is legal for 12 hours. After the sirens signaling the event blare, a group of five strangers are joined in a fight for survival. Waitress Eva (Carmen Ejogo) and daughter Cali (Zoe Soul) are first targeted by a neighbor and then a much more organized and ominous (and not very well fleshed out) threat. On the verge of a breakup, couple Liz (Kiele Sanchez) and Shane (Zach Gilford) catch the eye of a mask and make-up wearing gang that tampers with their car and strands them downtown. (I think I would be sure to be off the streets and in my house more than 2 hours (or 2 days) before the commencement of The Purge, but that’s just me.) 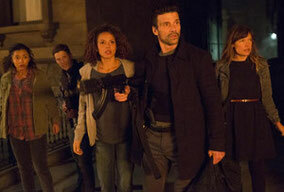 The four easy targets cross paths with Leo (Frank Grillo), who’s on a mission of revenge, but pauses to save them. Now the group has to avoid murderous gangs, murderous rich people, a murderous militia, and any other strangers thirsty for blood. Returning writer/director James DeMonaco expands his universe by way of stereotypes, shabby expository dialogue, and a halfhearted exploration of class warfare. The non-purgers traversing the city are each given conveniently thin, sympathetic backstories: the poor waitress with a sick father, the cute couple at a relationship crossroads, the capable leader looking to right a horrible wrong. DeMonaco doesn’t use his characters as anything other than exposition cyphers to explain everything that pops up on screen. Given the conceit of the Annual Purge, commentary about a stockbroker strung up by angry investors or a rooftop sniper speak for themselves. We also don’t need exclamations like “He’s been shot!” or “Oh, my God!” but we get plenty of them. Grillo proves a believable hero of sorts, while Soul adds just that to the headstrong Cali. Moments between these two are the best character beats, with him becoming a natural caretaker to the plucky, smart teen. Unfortunately, the rest of The Purge: Anarchy is too concerned with shoehorning in a multitude of grim micro-subplots that muddy the already dark film and don’t allow us to get too attached to anything or anyone. Eva’s physically sick grandfather is introduced and his story is dispatched of by way of a random device that DeMonaco just wanted to fit in the script somewhere. One gadget scene that almost works takes place in the apartment of Eva’s co-worker – palpable tension is built, but dissipates with the first foreseeable gun blast. It’s ironic that a film about this subject matter with “Anarchy” in its title feels so contrived. While acts in the film are despicable and frightening, it all feels staged. Violence isn’t scary or as chilling as it is an inevitability to keep things rolling forward. Motorcycle punks, a macabre group of one-percenters, a potential Big Bad by the name of Big Daddy (Jack Conley) appear, serve their purpose, and disappear. That is, until Big Daddy shows up solely to explain his existence to a wounded adversary. Even a revolutionary anti-Purge movement fails to register and it’s never clear how the guerilla group fits into the grand scheme. Two films into this series we have one that was too confined to explore the depths of the Annual Purge and one that is too broad to follow through on any of the notions that make this dystopia worth studying. There will no doubt be additional Purge sequels; hopefully they’ll start answering some of the fundamental questions instead of just trying to explain away the carnage.